Hackerman ransomware uses sophisticated techniques to infiltrate computers and hide from its victims. Use Reimage to determine whether your system is infected and prevent the loss of your files. When did the ransomware take control of your PC? 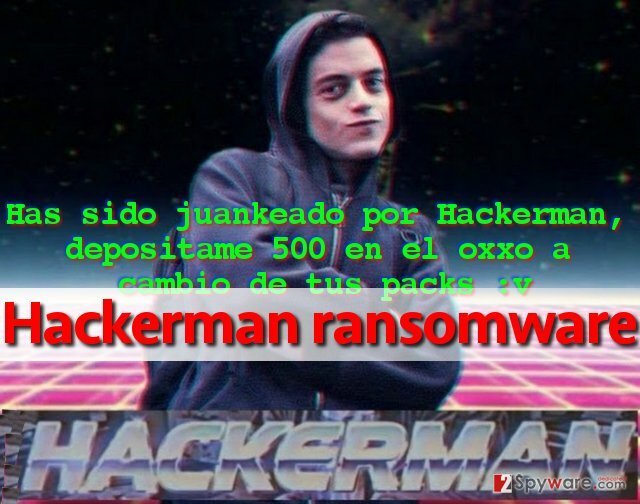 Has sido juankeado por hackerman, depositame 500 en el oxxo a cambio de tus packs. If you have been infected with this malicious program, we suggest you to remove Hackerman malware using anti-malware software instead of paying the ransom to criminal dubbed Hackerman. Most likely he doesn’t care about your files and just wants you to donate your money to him. Do not follow commands of a criminal, and implement Hackerman removal right away. If this virus found a way into your computer system recently, it means that your PC is not protected well enough and that it is open for further malware attacks. Ransomware can be stopped with a help of powerful anti-malware, but if you do not have it, then it becomes very easy to deliver this illegal program to your system and execute it there. Most of the time, criminals deliver ransomware executables via email. They send legitimate-looking messages and attach documents that seem to be secure at the first sight. However, once opened, they either immediately infect the system or activate a malicious script that downloads the malicious program from the Internet. Criminals no longer need to send .exe files to infect the system – they can deliver the virus in .doc, .pdf, .dll or .js format files. Sometimes the victim just needs to enable Macros in such hideous document in order to activate the malicious code that reaches certain server and downloads the ransomware from it. However, Hackerman virus seems to be using the most primitive dissemination method and currently it is being distributed via malicious email spam campaigns. Ransomware virus is not a simple piece of software. It does not drop an uninstaller after infecting the system. To remove Hackerman virus, the user needs to gather registry keys, executive files, ransom note and other components related to it and remove them all at once. This can be quite a challenging task, so we suggest you delegate it to a good anti-malware software. In order to start Hackerman removal procedure, use these instructions and set some things up to prevent the virus from blocking your anti-malware tool. Log in to your infected account and start the browser. Download Reimage or other legitimate anti-spyware program. Update it before a full system scan and remove malicious files that belong to your ransomware and complete Hackerman removal. When a new window shows up, click Next and select your restore point that is prior the infiltration of Hackerman. After doing that, click Next. Once you restore your system to a previous date, download and scan your computer with Reimage and make sure that Hackerman removal is performed successfully. Guide which is presented above is supposed to help you remove Hackerman from your computer. To recover your encrypted files, we recommend using a detailed guide prepared by 2-spyware.com security experts. If you do not have the decryption key, use this HiddenTear BruteForcer tool to figure out what it is. To brute force the key, use a .png file from Sample pictures folder as an example. Warning: do not use a .zip file as an example of encrypted file! Use the key in HiddenTear decryptor to restore your files. This entry was posted on 2016-11-15 at 06:26 and is filed under Ransomware, Viruses. You can quickly scan the QR code with your mobile device and have Hackerman ransomware virus manual removal instructions right in your pocket. How did you remove Hackerman virus?